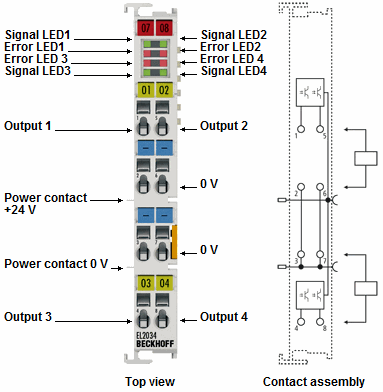 The EL2024 and EL2034 digital output terminals connect the binary 24 V control signals, electrically isolated, with the actuators. 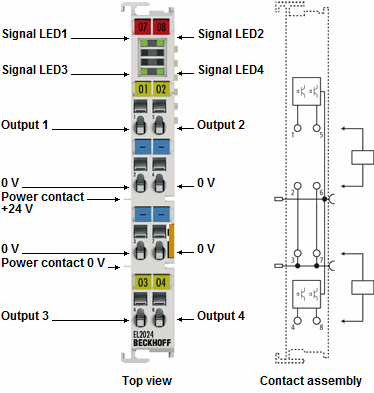 Four channels are available and indicate their signal state via LEDs. The terminals enable direct connection of four 2-wire actuators. They feature four earth connecting points. The EL2034 offers output diagnostics in the form of short circuit and open circuit detection per channel.